The desire for low-maintenance landscapes just keeps growing. At the same time, Americans’ love for outdoor amenities like fire pits, grills, dining areas and seating shows no signs of waning. So combining the two should mean less work and more play, right? Here, we suggest fuss-free flowers and foliage for outdoor living. Whether you’re relaxing during a private moment in your personal sanctuary or are hosting a dinner party, you don’t want to come out to a tired, ailing landscape. The idea is to go for something that’s easy-care, with season-long interest, so you never have to worry about what’s outside your door. We all lead such busy lives. You don’t want an outdoor living space where you’re looking at more chores or another to-do list. If you’re looking for less watering, spraying and pruning, flowers aren’t out. I suggest you try drought-tolerant, blooming perennials like nepeta (catmint), hardy cranesbill geranium, Russian sage, lavender, echinacea (coneflower), sedum, rudbeckia (black eyed Susan) and yarrow. The Flower Carpet®line of landscape roses can be a great choice for low-maintenance, season-long color in beds or containers. 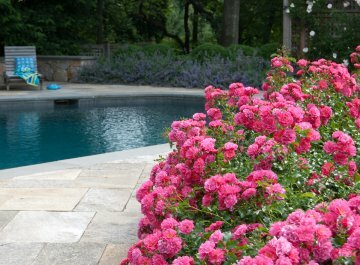 When planted en masse, carpet roses (which spread more horizontally than vertically and become covered with a blanket of blooms) are also a great way to quickly fill in a large bed while turning it into a more low-maintenance, sustainable landscape. Native and adapted plants (those that naturally grow or thrive in your area without using a lot of resources, respectively) will also work for a low maintenance planting. Native plants are especially nice for outdoor leisure areas, because you’re inviting in the local cycles of wildlife and a balanced local ecosystem, which means wonderful extras like singing birds, the sight of butterflies and nature’s own methods of pest and disease management. Visit the Grow Native website at http://grownative.org/ for lots of great information on native plants for our area. Low-maintenance foliage can also soften and add character to outdoor living spaces. Going without flowers doesn’t have to mean no color. 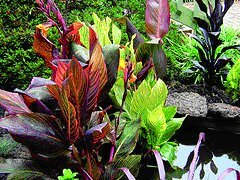 The colorfully foliaged Tropicanna®cannas, which can handle wet feet, can be potted and set right into your favorite water features. And the dark-red, strappy foliage of Festival™ Burgundy cordyline (at right) is so extremely drought-tolerant and pest resistant, you’ll wonder if it’s real. Its basal-branching low-growing structure allows for fuller, more compact clumps and a gentle fountain effect – perfect for containers or color blocking around your favorite outdoor living spots. Of course, the plants themselves aren’t the only part of a low-maintenance landscape. There are also tips and tricks like mulching, grouping together plants with similar needs, efficient irrigation, reducing your lawn and maintaining healthy soil. But low-maintenance plants are a key ingredient. Some work in the garden is great if you enjoy it, but we all have tasks we’d rather not do. I know I’d rather be doing artful pruning, potting up containers and deadheading instead of weeding or mowing. The idea is to reduce or eliminate what really feels like work so you’re free to focus on what matters to you.